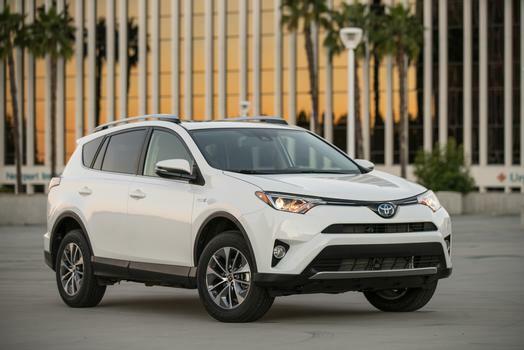 When it comes to compact SUVs, the 2017 Toyota RAV4 offers a unique combination which simply outdoes the competition. Among the many highlights is a cargo area that's incredibly large, making it easy to haul around everything you need. The ride quality is comfortable, yet still engaging enough to keep drivers entertained. Numerous advanced safety technologies are standard on each trim level, while the various intotainment systems are simple to use and loaded with useful features. All four available trim levels come with the same 2.5-liter 4-cylinder DOHC engine. Peak output is rated at a solid 176 horsepower and 172 lb.-ft. of torque. Mated to the engine is a 6-speed automatic transmission, with paddle shifters for manual shifting optional. While front-wheel drive is standard for all models, the alternative is all-wheel drive with dynamic torque control. Drivers will love the way the MacPherson struts up front and double-wishbone suspension for the rear allow the 2017 Toyota RAV4 to confidently carve through turns. The setup also makes for a smoother ride, pleasing passengers as well. SE models get a sport tune for the suspension, plus fun blue front shocks. Safety is a big deal for most people, but owning a 2017 Toyota RAV4 will supply some peace of mind. The compact SUV packs the Star Safety System for each trim level, combining vehicle stability control, traction control, antilock brakes, electronic brake force distribution, brake assist and Smart Stop technology to prevent accidents. Even more impressive is the inclusion of Toyota Safety Sense P on each model. It bundles together a pre-collision system with pedestrian detection, automatic high beams, lane departure alert with steering assist and dynamic radar cruise control, surpassing the offerings on completing vehicles. Shoppers can opt for a number of additional technologies, such as blind spot monitor with rear cross traffic alert, for even more accident prevention. A rearview camera comes on all 2017 Toyota RAV4 models, showing live video on the 6.1-inch screen. the optional bird's eye view camera is handy for squeezing through tight spots, plus with its perimeter scan function you can see a live image of whatever is immediately around the SUV while it's parked. In the unfortunate event of an accident, eight airbags are included, providing exceptional coverage for everyone in the outboard seats. Naturally, people get SUVs for their cargo-carrying abilities, among other things. 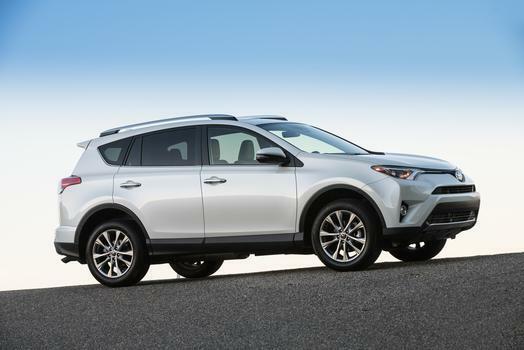 The 2017 Toyota RAV4 really shines in that area, with plenty of space behind the second row. When more cargo volume is needed, the backseat is on a 60/40 split, allowing owners to transport a combination of passengers and cargo. A clever cargo net hammock is available, and can be placed in a number of positions to divide gear and keep it secured. Many other features make the interior of the 2017 Toyota RAV4 a place where everyone will love spending time. Instead of a traditional design, the cupholders are made to work with bigger mugs, even if they have handles. XLE, SE and Limited models come with a power moonroof, while a HomeLink controller is available for certain trims.